Sometimes a piece of music and an exceptional performance of it seem to telegraph to us some of the information we would need to know about what it is, how it works, and its presence in the world. Such may be the case with a rendition of Steve Reich’s “Music For Pieces Of Wood” by the esteemed percussion ensemble Nexus. 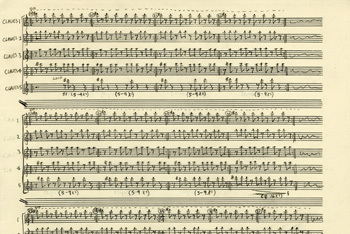 Composed in 1973, “Music For Pieces Of Wood” is scored for five sets of tuned claves. One percussionist plays a steady timeline to establish the tempo grid for the piece and keep the other musicians in sync. A second player adds a repeating 12-pulse pattern. The other three players then add to the texture by playing the same yet rhythmically displaced pattern as the second player, building their parts up one note at a time. As the piece unfolds through different variations on this idea, the effect is hypnotic–like a slowly unfolding musical puzzle. transfixing for sure. Amazed they could end it so together!